Practice Kindness is committed to protecting your privacy and ensuring that your visit to our website is completely secure. 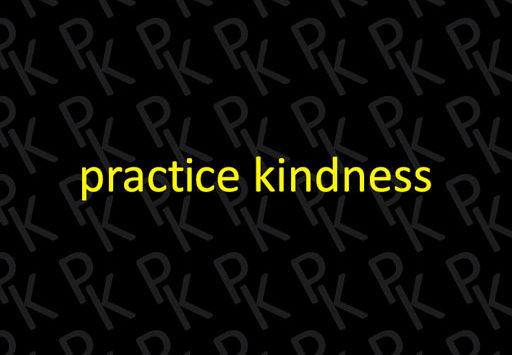 Once the information is in our system, it is accessible to authorized Practice Kindness personnel only. We strictly enforce our privacy policies with our employees and any breach of this policy will result in termination and the pressing of criminal charges where there are grounds. Your personal information will be used in order to provide you with the requested products and services. This includes the use of information for completing transactions or communicating with you. Credit card numbers are used only for payment processing and are not used for any other purpose. We may also use personal information in a manner that does not identify you specifically, nor allow you to be contacted, but does identify certain criteria about our Site’s users in general (such as we may inform third parties about the number of registered users, number of unique visitors, and the pages most frequently browsed). Users consent to storing and using your personal information and messages. We do not share your messages or data with third parties. Forum members can select to have hidden profiles. We will not sell, trade, or rent your name or personal information to a third party. We do not sell, trade, rent, or provide outside access to our mailing list. Practice Kindness will not release your personal information to authorities unless required by law, search warrant, court order, subpoena, or fraud investigation. Except as otherwise stated in this policy, Practice Kindness will share your information with third parties only to the extent necessary to provide the services and products requested by you. All such third parties are prohibited from using your personal information except to provide these services and they are required to maintain the confidentiality of your information. Practice Kindness only saves such personal information that is necessary for you to access and use our services, after which it is permanently deleted/purged. This personal information includes, but is not limited to, first and last name, email address, phone number, other payment processing information and document creation data.